In the spring of 1994, the Jews and the Jain went to San Miguel de Allende for Semana Santa, the Holy Week between Palm Sunday and Easter. The Jews consisted of my husband Michael and myself, our two sons - Josh was a senior in high school and Andy was a sophomore - and Josh’s friend Rahul, a big Indian kid who happened to be a Jain. And there was also my mother Muriel. She was the reason we went to San Miguel. My father had passed away the previous year, and mom did not want to deal with preparing Passover for the family. She wanted to get away to a town that was one of the few places in Mexico she and dad had never visited. She planned to take an art class at the Instituto Allende, and she knew someone from whom we could rent an apartment. Fast forward twenty-four years. 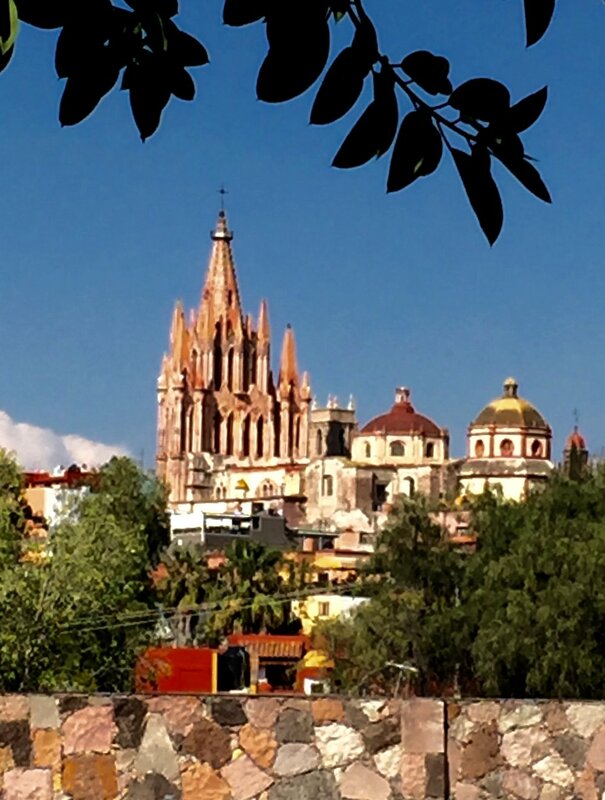 My husband and I are in San Miguel de Allende for a planned winter trip, but it hasn’t been that simple. My mother just passed away, and we are spending a couple of weeks in a town now filled with memories. I’m not sure she was aware that we were planning to come here again. But rather than it being a sad experience of loss and separation, I am finding my mother in many places in San Miguel. There's an active Jewish community here. They do a special Shabbat (Sabbath) on the first Friday of the month with a lot of singing, and we decided to go. It was three weeks since mom passed away, and I wanted to go to say mourner’s Kaddish for her. Refreshments start at 5:30, and the service begins at 5:50 and ends around 7:00, so you have the rest of the evening free (they even say this). There were only a few name tags left by the time we arrived, but Michael and I each got one. We went to get something to nosh on and started chatting with a woman who also had a name tag -- which said Muriel! Was this a sign from my mother? After all, Muriel is not a very common name. Of course I had to tell Muriel about my mom Muriel and got choked up in the telling. She seemed to want to get away from me quickly or maybe I imagined it. I didn’t go on for a long time or speak in much detail, but it shook me up a bit. My friend Judie kept telling me to ask my mom what sign she would give me from the other side, but I never got a chance to ask her. Was this the sign, that I would meet other Muriels? A few days later we were having lunch with new friends we’d made on a recent trip with this same aforementioned Judie, and I was telling them about meeting another Muriel. Mel said his mother’s name was Muriel! Then a few minutes later a small white feather landed on our table. Ordinarily a white feather would be brushed away, but we all knew that the white feather was the sign from Judie’s mother! Both mothers popped up at the same time from the beyond. Walking around San Miguel one afternoon, we found ourselves on a street called Jesus. The sidewalks are narrow here, and you don’t dare look around while you’re walking for fear of breaking a leg. I guess I paused because I looked across the street and saw what looked like Hebrew transliteration on a sign. It said B’nei Or. We crossed and entered an art gallery. I looked at a painting, and things about it seemed very familiar. I knew many of the design elements and techniques all too well. One look at the signature on the painting told me why: David Leonardo, 1994. He created the painting of a conquistador that we schlepped back in a tube from San Miguel in 1994. It now hangs on the wall directly across from the front door of our house in Santa Fe. Before we left home, I had looked up the gallery name where we had bought it. The owner of that gallery had died, and I wondered if we'd be able to find the gallery that was now representing David Leonardo. And here we were. I told the young saleswoman whose father owns the gallery that we had bought one of David’s paintings in 1994. She said David still lives in SMA. I was confused by the name of the gallery. We wondered if David was Jewish or a converso (a Jew forcibly converted to Catholicism during the Inquisition). She said he was neither, but he was very interested in Kabbalah, had studied a lot. It was he who had chosen the name for the gallery which means children of light. 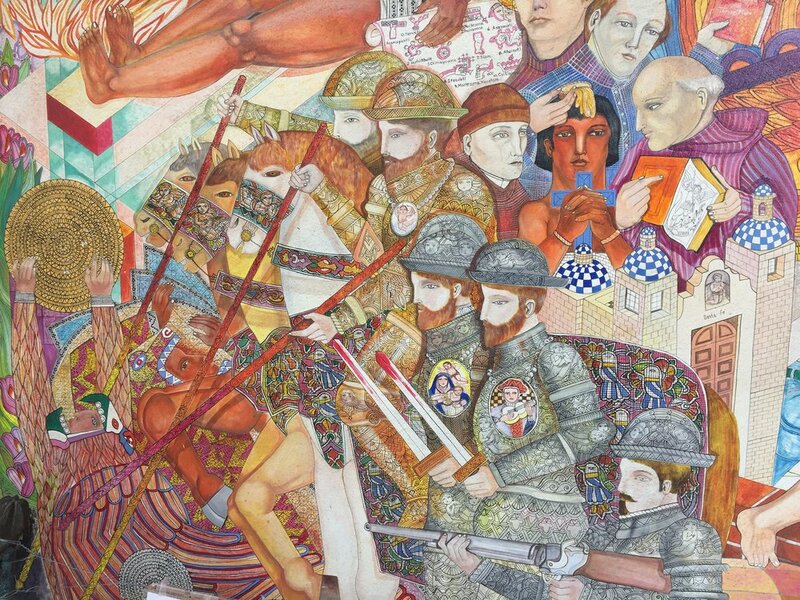 We looked at David’s work and saw that he has moved on to different styles, but it seems he did a lot of conquistadors in the 90’s, and several were on display. When we bought David's painting in 1994 it was quite expensive for us; I don’t think we’ve spent more on any piece of art since. I remember that the gallery owner at the time, Josh Kligerman, told us that David was an up and coming young muralist. I also remember that the gallery owner looked a lot like my dad who had died seven months prior to our trip. Was it my mom who noted the resemblance? I don’t recall, but I’ve always felt that resemblance influenced our purchase of the painting. It was as if my dad had joined us for a short time. The young saleswoman said David still hangs out at the Instituto Allende and painted a mural there in 1999, so we went on a Sunday to check it out. 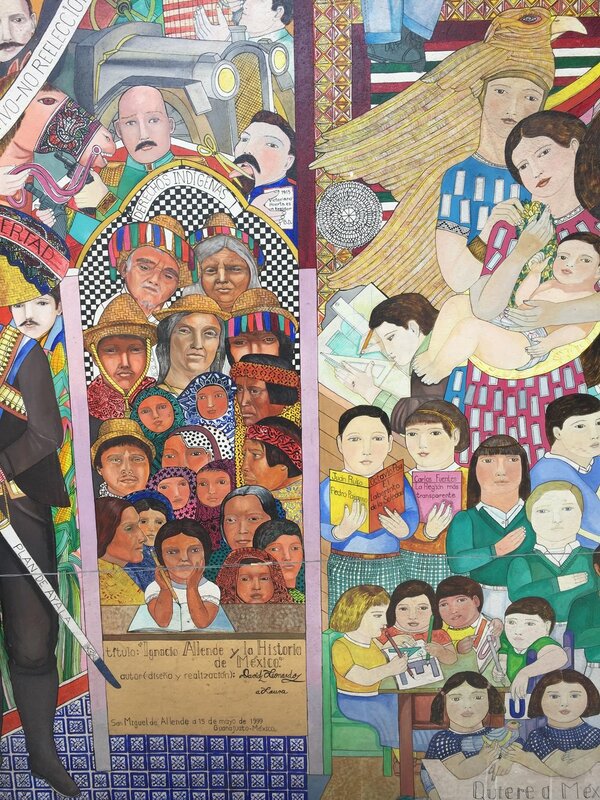 Clearly in the tradition of Mexican muralists, David filled it with historical figures and images. It is dramatic and sweeping in its scope. David’s signature design elements were present: his sgraffito technique, round mandalas (that perhaps represent the Aztec calendar), a checkerboard pattern, and pictorial narrative details on armor and clothing. It was these patterns and designs which originally drew me to our painting, despite the topic. At the Instituto, he displays these same techniques on a huge wall. 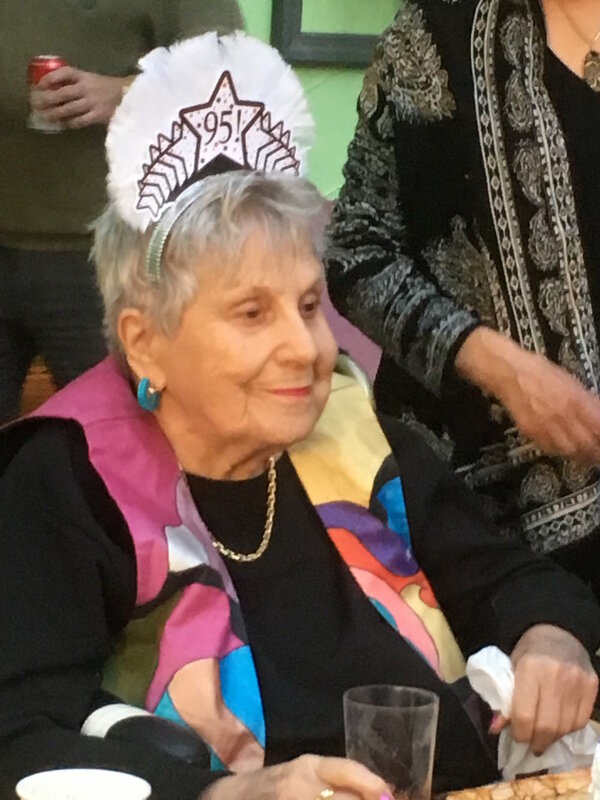 Mom at her 95th birthday party. There wasn’t much activity at the Instituto. The galleries and the cafe were closed, but we wandered a bit, looking at student murals and other works of art on the walls. My mom took a class in clay sculpture here in 1994. After the rest of us returned home, she stayed on and moved to another apartment closer to the Instituto. She had taken up stone sculpture about 15 years prior to the trip and was somehow able to see into the rock before her and chisel it away to bring out the beauty of the stone. She had taken classes in Pietra Santa, Italy, where Michelangelo got his marble, and in Marble, Colorado. There was no stone sculpture class at the Instituto, so she settled for clay. As we walked out to the terrace with its panoramic view of the town’s iconic church, I realized that I don’t remember hearing much about her time as a student here. Did she meet other students her age? Was the cafe a place where she hung out? What was the new apartment like? Where did she buy her groceries or did she eat her meals in restaurants? SMA is a big tourist destination now. But then? Surely she met other seniors who were visiting, since she was extremely gregarious and would talk to anyone. Did she take part in any of the many activities in town? Was she lonely? Did she enjoy being alone? I’m now older than she was at the time and am blessed to be here with my husband. I can’t imagine being here alone. How could she not have been lonely, missing her life with my dad? What did she think about? Now I’ll never know. All I remember is that she told us she didn’t like working in clay as well as stone. She preferred being a chiseler who went into the stone rather than someone who built up the piece from the inside out. While in the class, she created a small mother and child which she later had cast in bronze. My brother plans to make a mold and create it again in clay. Here in SMA, thoughts about my mother are frequent. Back in St. Louis my sister and brothers are arranging for an estate sale. It was pure coincidence that we decided to come here again after all these years. It has proven to be a perfect place to recover, to grieve, and to reminisce. I’m sure I’ll continue to find my mother in San Miguel in the days that remain. Laurie Gilberg Vander Velde and her husband Michael live in beautiful Santa Fe, their departure point for travel around the world. When they aren’t traveling, they volunteer their efforts with the Museum of International Folk Art and the International Folk Art Market, two very different, world-focused entities.